We have arrived to Labor Day weekend, the un-official end of summer. Many of our college students have returned back to school already. Both public and catholic school students get back to the classrooms for another academic year. In a very special way, we pray for students and teachers who make their way back to the classroom for another exciting year of growth and learning. We pray that the Holy Spirit will enlighten the minds of all our students,that they will continue to grow and mature in God’s image and likeness. Jesus tells us in today’s gospel, “Get behind me, Satan! You are an obstacle to me. You are thinking not as God does, but as human beings do”. It is my prayer for our young people that they will not be lured by worldly things, but only that which comes from God. Satan wants to be an obstacle before us. He wants us to focus on worldly desires and possessions. It’s very easy to get caught up in the things of this world, but Jesus is challenging us to not fall into that trap. We must always keep our eyes on the Lord of heaven and earth, so that we will continue to be faithful and holy witnesses. Let us defeat Satan by bringing this light and love of Christ to our world that is in desperate need of him! Next Sunday, September 10, we will celebrate the opening Mass for the 150th Anniversary of Our Lady of Victory Church. I want to thank our Anniversary committee for the hard work that each of them has done in planning the events throughout the anniversary year. Next week we will welcome some of the former priests of the parish, alumni of the school, and parishioners who have moved out of Brooklyn. It is with great joy that we welcome Most Reverend Neil Tiedemann, our newest Auxiliary Bishop as the main celebrant and homilist. This will be his first visit to Our Lady of Victory and he is very much looking forward to beginning this celebration with us. There will be only one Mass celebrated next Sunday, which will be at OLV at 10:30AM. There will be the Saturday night Vigil Mass at St. Peter Claver Church at 5:00PM. Registration has begun for the new academic year 2017-2018 for our parish school of faith formation. All students preparing to receive the sacraments must be registered in our parish faith formation program. There is also ongoing catechesis for those who have completed the sacrament of Confirmation. The Diocese of Brooklyn has implemented a two-year period of catechesis before the reception of First Holy Communion. There are registration forms available at each of the three churches and on our website. Tomorrow, Monday September 4 is Labor Day. The parish office will be closed. There will not be a 12:00Noon Mass at St. Peter Claver on Monday. There will be one Mass celebrated at 8:00AM at Our Lady of Victory. It’s so good to be back home! I want to thank all of you for your prayers as I went on pilgrimage to the Holy Land in Israel. It was truly a great blessing for me to celebrate Mass at the major places, depicting our salvation history. Two major highlights of my pilgrimage was celebrating Mass on Calvary, where our Lord died on the cross. The other of course was celebrating Mass on the tomb of which our Lord was raised from the dead. I brought each of your prayer petitions and intentions with me. Please be assured that all of you were in my thoughts and prayers as I journeyed in the footsteps of Christ the Lord. Today, we celebrate the Feast of the Transfiguration. Jesus brought his disciples, Peter, James and John to Mount Tabor, and all of a sudden Jesus is transfigured before their very eyes. It was at the moment of the Transfiguration that Jesus showed his divinity to his disciples, and ultimately to us. I love the response that Peter, James and John give to the Lord before he is transfigured. They say, “Lord it is good that we are here”. Each and every Sunday when we gather for Mass, we must utter those same words, Lord it is good that we are here. It is good that we are able to worship as a community of believers. It is good that we are able to profess our faith, without the fear of persecution or strife. As we celebrate this beautiful feast today, let us pray that we will continue to preach the good news of Jesus, in all that we say and do. Let us not allow fear to get in the way of bringing people closer to the heart of Christ the Lord. Registration has begun for the new academic year 2017-2018 for our parish school of faith formation. All students preparing to receive the sacraments must be registered in our parish faith formation program. There is also ongoing catechesis for those who have completed the sacrament of Confirmation. 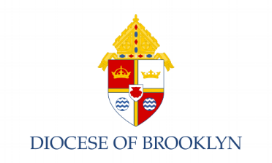 The Diocese of Brooklyn has implemented a two year period of catechesis before the reception of First Holy Communion. The registration form is now available for download on our website. There are registration forms available at each of the three churches as well. Next month we will kick off the celebration of the 150th Anniversary of Our Lady of Victory Church. The solemn opening Mass will take place Sunday, September 10 at 10:30AM. There will be one Mass celebrated that Sunday. There will be a 5:00PM Mass on Saturday, September 9 which is the feast of St. Peter Claver. All are invited to the Holy Spirit revival that will take place at Our Lady of Victory Church Friday August 11 at 7:00PM, Saturday August 12 at 7:00PM and concluding with the 10:15AM Mass on Sunday August 13. Father Anthony Ozele will be the preacher. Please join us and bring a friend.